To convert the M966 weapon system from the MK 19 mode to the TOW 2 mode, the crew performs the following actions. (1) Places the traversing unit in the traveling position. (2) Obtains the nightsight and collimation cases from the stowed position and places them on top of the vehicle near the gunner. (3) Stows the gun cradle/ammo bracket, T&E mechanism, and empty case catch bag assembly. (4) Unstraps the missile guidance system (MGS), unlatches its cover, and stows the MGS in the commander's footwell. (5) Connects the J-1 cable and the battery power conditioner cable to the MGS and MGS battery power conditioner. (6) Connects the nightsight power conditioner cable to the TOW vehicle power cable (TVPC), uncoils the cable and hands it up to the gunner. (7) Ensures that the power cable is connected to the TVPC, and that the TVPC switch is on. (8) Assists the gunner in boresighting the system. (1) Raises the top cover and releases the ammunition belt from the feed tray and places it in the ammunition can. (2) He takes the round or spent cartridge case from the bolt fingers, places it in the ammunition can, and closes the top cover. (3) The gunner releases the MK 19 from the gun cradle, lifts the MK 19 out of the gun cradle, and gives it to the driver. (4) The gunner releases the T&E mechanism from the pedestal with the train lock handle. (5) Removes the empty case catch bag assembly and gives it to the squad leader. The gunner moves the ammo can and gives it to the driver. 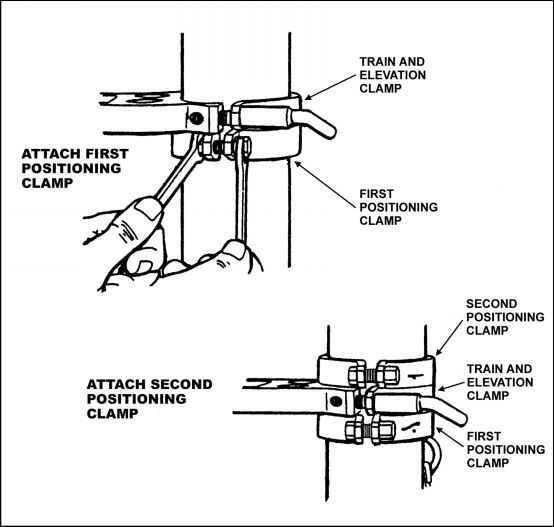 (6) Removes the gun cradle with the T&E mechanism attached and hands it to the squad leader. (7) Opens the pedestal mount cover and secures it. Lifts the traversing unit with adapter from the stowage base and secures the traversing unit to the pedestal mount with the coupling clamp. (8) Receives the launch tube from the driver and secures it to the traversing unit. (9) Receives the optical sight from the driver and installs it on the traversing unit. (10) Opens the nightsight case, removes nightsight device and installs it on the optical sight and hands the case to the driver. (11) Takes the TVPC cable from the squad leader and installs the nightsight device. (12) Opens the collimation case, removes the collimator, attaches to nightsight, and connects collimator power cable. (13) Assists the squad leader in boresighting. (14) Collimates sights, removes collimator and power cable, stores collimator and cable in case, and hands case to the driver. (15) Receives the missile from the driver and loads it in the system. (1) Dismounts the vehicle and enters the right rear passenger door and then unlocks and opens the cargo hatch. (2) Stows the MK 19 when received from the gunner. (3) Stows the ammunition can when received from the gunner. (4) Places the optical sight on top of the vehicle for the gunner. (5) Unstraps a missile, inspects the missile, and gives the missile to the gunner. (6) Ensures every item in the cargo hatch is secure, closes the cargo hatch, exits the vehicle through the right rear passenger door and takes his place as driver.